Computers up to six years old will be able to upgrade to Windows 10 for free when Microsoft releases it globally on 29 July. Microsoft is offering existing users with a Windows 7 or Windows 8.1 computer one year to take advantage of the free upgrade offer. Windows 10 is the first generation of the operating system to be released under Satya Nadella after he was appointed chief executive of the company in 2014. The operating system adopts a ‘touch first’ approach to computing, with its Windows Office suite of applications capable of running without a cursor or a keyboard. New features in Windows 10 include the company’s Cortana personal assistant, its Edge web browser (formerly known as Project Spartan) and Continuum, which makes it possible to transition between devices running Windows seamlessly. A new feature called ‘Windows Hello’ makes it easier to log into a computer by ditching passwords in favour of biometric authentication, such as facial recognition of fingerprint scanning. Returning to Windows 10 is the iconic ‘Start’ button. Microsoft controversially removed the button in Windows 8 in favour of live tiles. The two — start button and tiles — will be merged together in the upcoming operating system. 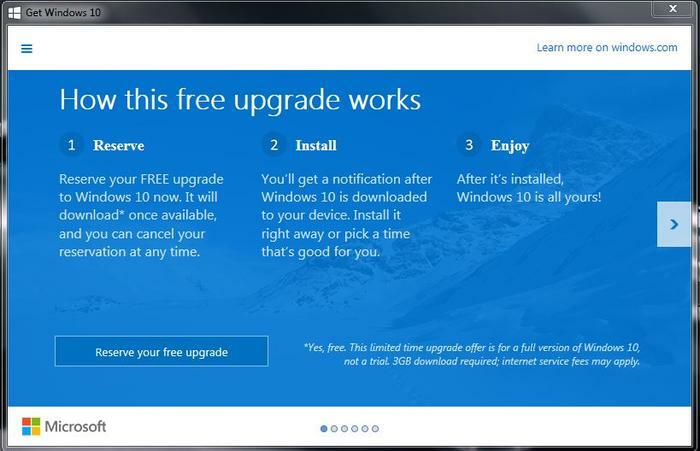 Microsoft is taking reservations for free upgrades to Windows 10 from today. Eligible computers will receive a notification asking users to register their interest.